Most UBC students are women. So why are all the presidential candidates men? In recent years, many AMS leaders have been female. So why are they so under-represented in elections? Only nine out of twenty-four AMS, Senate and Board of Governors candidates are female, and all five presidential hopefuls are men. Fifty-six per cent of students on campus are women — but candidates and incumbents alike say there are significant barriers to women running. This mirrors low female representation outside the university. In the 2015 federal election, 88 female MPs had been voted in to the 338-member House of Commons — a one per cent increase from 2011’s numbers. And like the House of Commons, the AMS executive, Senate and Board of Governors have historically been dominated and led by men. Compared to last year’s AMS elections, where a third of candidates were female, there has been a five per cent increase in the number of women seeking office. None of the current candidates identify as non-binary. Current AMS President Marium Hamid says women and non-binary people often feel like they’re not welcome in positions of power — even when they’re qualified or overly qualified for the job. Some candidates said that they faced additional barriers because they also belong to minority or equity-seeking groups. “I can’t speak for the women currently running in the elections but for me, there was an additional barrier of being a person of colour, with cultural barriers,” said former AMS VP External Sally Lin. 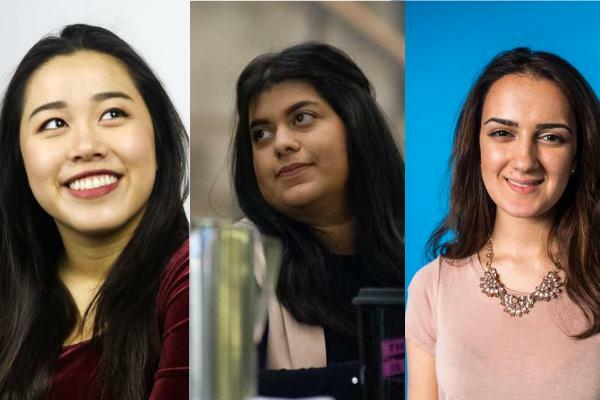 But while progress has been modest, many AMS executives in recent years have been women including Hamid, Lin and former AMS President Ava Nasiri. When asked what advice she’d give to a woman considering running for a race, Nasiri’s advice was to never underestimate your self-worth. Many candidates say the major factor that convinced them to run was a positive role model in the AMS, as well as a network of friends and supporters who kept them moving forward.